Whether you’re a new business or a well established multinational organization, it probably comes as no surprise that doing business in the United States comes with a multitude of complex tax challenges. With potentially hundreds of unique tax types (e.g., state income taxes, city license taxes, sales taxes etc.) being imposed by literally thousands of taxing jurisdictions (e.g., state level, county level, city level), ensuring that you and your constituents are paying your fair share of state and local taxes (“SALT”), but not a penny more can quickly become a full time job. Just knowing where to begin can be a daunting proposition. At CT Tax, our goal is to help you minimize your SALT burden using practical and efficient methods that were developed over decades while serving some of the most innovate and complex companies in the world. At CT Tax, we bring a different, practical perspective to bear on you tax issues. We are a boutique SALT practice that focuses on one thing and one thing only: minimizing your state and local tax burden. Call us and find out why we are the trusted specialty SALT services provider to some of the largest companies in the world. We want to be your trusted SALT services provider as well! We understand that every issue is unique, and objectives are not always linear. 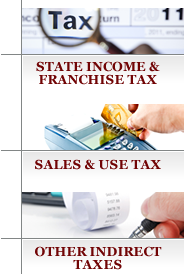 Helping you implement state and local tax solutions that are right for your business is what we do best. Call us, we can help! Filing a tax return to report a transaction is but one of the pieces of the SALT cycle. At CT Tax, we like to think about your issues through each of the stages of the tax cycle: Planning, Reporting, Accounting, and Controversy. Planning. One of the fundamental duties of any tax professional is to analyze a set of facts, identify an issue or opportunity, and devise and execute on a plan in order to mitigate or capitalize on such issues and opportunities. AT CT Tax, we place equal value on our analytical and creative skills. We have the practical experience to help you identify and work through complex SALT issues and the creativity to help you see opportunities where others may see barriers. Reporting. This is where the rubber meets the road. At CT Tax, we have the patience, discipline, and expertise to help you manage your multistate SALT compliance requirements. Whether it’s preparing or reviewing state income tax apportionment workpapers, or preparing sales and use tax returns, we at CT Tax have the experience and expertise to help you minimize risk during this crucial stage of the tax cycle. Accounting. Regardless of whether you are a private company or are publicly traded, being able to properly analyze and disclose tax risk to your stake holders is a critical skill for today’s tax professional. CT Tax can help you analyze a transaction for purposes of an ASC 450 or ASC 740 accrual so that you don’t get caught flat footed on an issue that carries risk. Controversy. Let’s face it, in today’s world, ambiguities in the tax law are not uncommon and disagreements with the state tax authorities on the proper treatment of an issue or transaction can occur. Opinions involving the same set of facts are subjective by nature and finding oneself embroiled in controversy is a fact of life for today’s multistate SALT professional. Navigating through and effectively managing the various states’ audit, protest and administrative appeals processes is a core competency for CT Tax.